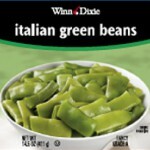 Winn-Dixie stores is voluntarily recalling Winn-Dixie Brand canned Italian Green Beans because of potential for in-shell peanuts mixed in with the beans. The recall is being initiated “out of an abundance of caution” for consumer safety. A peanut allergy can be severe and life-threatening. People with peanut allergies can develop anaphylactic shock, which can be deadly. Other allergy symptoms include hives, swelling of the lips, skin, face, and throat, abdominal pain, vomiting, diarrhea, and asthma. If you have any of these symptoms, contact a doctor immediately. For questions, please call 1-866-946-6349. If you have purchased these green beans and have an allergy, you can return them to the place of purchase for a full refund.